Everyone responds instinctively to music. A person’s ability to engage in music often remains intact far into the advanced stages of dementia. Research into music and brain function has revealed that music triggers certain networks of the brain that benefit people who have difficulty with language, cognition, or motor control. Music therapy is a research-based practice and profession in which music is used to actively support people as they strive to improve their health, functioning and well-being. Music Therapy is commonly used as an intervention for people living with dementia to reduce agitated behavior and improve communication. In the absence of a Music Therapist, you can still successfully incorporate music activities into your activity programs. Regular music sessions with familiar music is a wonderful way to positively influence mood and behavior. Music lights up the entire brain. Music Therapy can give people with dementia a break from confusion and fear. Some people can no longer remember their loved ones, but they still know all the words to their favorite songs. Music Therapy may even in some instances provide relief from pain and help people recover lost memories. Who can Benefit from an Individual Music Activity Session? Everyone can benefit from music activities! Regardless of genre, listening to music of your preference releases endorphins in the brain and may reduce anxiety, relieve depression and boost the immune system among other benefits. Music sessions should be designed to comfort, entertain and positively influence the lives of residents in long term care. It is important to establish objectives for Individual Music sessions to provide you with direction and assist in establishing whether the session is working. Music sessions can be Receptive or Active. Receptive sessions are when the individual listens to live or recorded music of his/her preference. Active sessions are when the individual participates by singing or playing a melodic or rhythmic musical instrument; or both. It is important to keep in mind that music triggers emotions from the past and that responses to these emotions can be good and sometimes painful. Be prepared to support, empathize and console people with sorrowful responses. A music session should evoke memories and create meaningful experiences for the individual. It should engage people emotionally, bring joy and validate feelings. The location of the session should be familiar to the person; their bedroom is often ideal for an undisturbed and serene setting. Use ‘live’ music if you have the resources. Various musical instruments can be used: flute, portable keyboard, ukulele, violin, or accordion. If using recorded music it should be chosen according to the individual’s preferences. Start session by asking the person which song she/he would like to hear. Try to engage the person by asking them what the song reminds them of. The resident should be encouraged to reminisce and sing-along with you. Sing the song and leave a few words at the end for the client to finish. If the person has difficulty singing try humming or la-laing. The duration of an individual music session should be around 30 minutes long as a rule of thumb (more if response is positive). Run sessions once a week or more, depending on time available. At the end of each session take notes and report your observations in your Progress Notes. If your client is unwell, offer to make a mixed CD with their favorite songs to listen to when you are not around. You can find music online and songs are not expensive, some as little as $1 dollar each. This can be a powerful gift for someone who has little time left. Ipods with personalized playlists are also a wonderful investment. If interaction is not possible due to medical diagnosis use to the same process of talking to the resident and explaining what you are playing next. You may be surprised at the shift in alertness and eye contact in some clients when the music is heard. If you get that sort of reaction you have achieved one of your goals. If you work with residents from a non-English background you may use folkloric music from their country. Hum the melody and observe resident's response. Even those living with advanced stages of dementia benefit from singing sessions. A singing session is engaging and simple to run. According to several studies, when spoken language does not seem to reach a person, music can function as a go-between by activating memory and emotions. When music preferences cannot be established, choose popular music from the time the individual was between 15 to 35 years old. Offer props as necessary: drums, maracas, cymbals, rhythm sticks, recorder, and keyboard; also use photos, posters, magazines. Keep on singing/playing music and wait patiently for a response. If no response is received don’t assume it didn’t work; come back the following week and try again. Duration of sessions should be approximately half an hour. Take notes and report your observations in your Progress Notes. People living with dementia can be transformed by music. 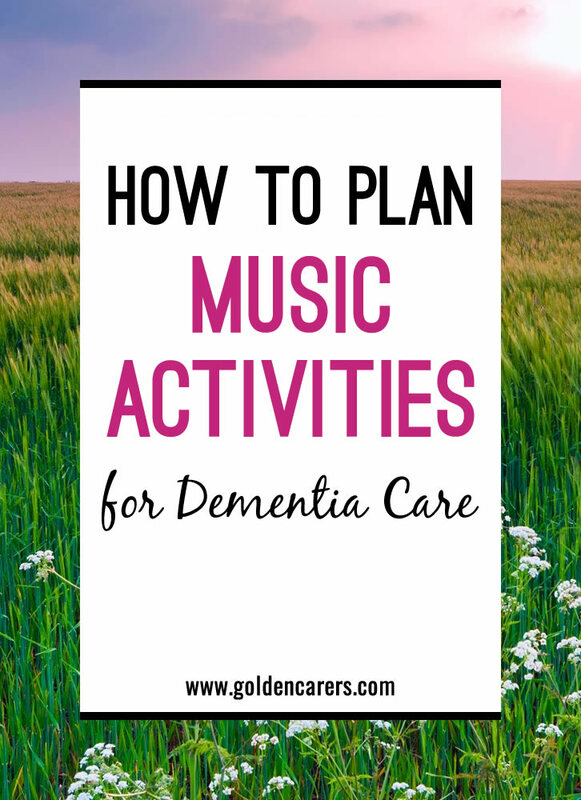 Incorporating music activities into your weekly activity program is well worth the effort. What has been your experience with music therapy for the elderly? I am responsible for the music in our Respite Ministry in our county. I disagree with starting a session by asking the participants if they can remember a particular song. I always begin with, let us reminisce together. I love your article but, I really disagree with this statement. RE: MUSIC THERAPY As a newbie on here, please take my observations with more than a grain of salt. While board certification as a music therapist indicates the likelihood that one has studied and can utilize music therapeutically, there are probably many others like myself with post-graduate degrees and/or experience in both Music performance (and music education++?) as well as psychology and mental health training. While credentialing is expanding the recognition and professionalism of certified Music Therapists there are many more without formal credentials in the field who can use their talents and training to bring new insights in care for the elderly and especially to those with dementia. I’m retired over a decade, yet each week I work with Alzheimers residents and see silence turn to song and frozen stares evolve into broad smiles and tears of joy as I share improvisationally on my keyboards and see the room come alive with clapping, waving, singing, and dancing. Yes, even uncertified musicians and teachers may well contribute much to this expanding field of elder care. Next project I’m hoping to help inspire is the building of a South Florida choir of folks with Parkinsons Disease like myself. I’d love to hear from others with ideas to exchange. Hi Dr. Miller, thank you for your feedback. It's wonderful to hear that you have had such wonderful results - there is nothing like listening to live music at any age! The residents are very lucky to have you. I think you're right and there are many ways to contribute with music activities even without formal certification. I think most people love listening to music they remember from the past. I love the idea of building a choir - keep us posted, we'd love to hear how it goes! Music is one of the best meaningful activies for people with Dementia, It lights up the whole brain theirs eyes light up big smiles on their faces clapping hands tapping feet some of the residents get out their seats and start dancing,play the ukulele don't worry if you can't play sing even when you sing flat they don't judge you it's the enjoyment participation fun it's meaningful for them it brings back happy memories for them.they love it. How does one find out what their favorite songs are if they can't answer your questions? As to finding appropriate songs....If you know the age range(s) of those being served you can select music from their formative years. I use “Spotify” (with very nominal prices for monthly subscriptions) and download the songs that correlate with those formative years onto old I-Phones that can be connected with small amplifiers. They can be stopped and started and repeated as often as needed.. Don’t forget, however, that using nursery rhymes and pre-K and elementary school songs are very welcome as are the lullaby’s sung for infants. My dementia residents love them all. Thanks for your feedback Shelley. Yes the article is about planning music activities in the absence of a qualified music therapist which unfortunately is a common scenario in many facilities. We will adjust the title accordingly. It is mis- leading to title this music therapy. A Board- Certified Music Therapist is required for music therapy programming. It would be appropriate to title this music activities. The brief mention of music therapy at the beginning of the article is not enough, could include a link to the actual music therapy organization. Hy Lyn, congratulations on your decision to play the ukulele for the residents. As you see, it was very successful; and what a good idea to have volunteers to come periodically to sing. You are an asset to your facility! On the first Friday of each month a group of (6) volunteers come in and sing for our residents. There are (6) very high care residents and they have warmed to the idea of the performers. I can play the ukulele and thought of bringing it in to play along as well with the singers. I was a little shy at first and stood back, being a different instrument caught everyones attention. Well I was well recieved from all around the hospital and everyone enjoys the venue of two hours. comments were made of how they had not heard of the ukulele for years. The residents look forward to seeing the group and hearing them sing and even put in requests. Those that didn't appear to be interested at first are waiting in anticipation for the singers next arrival. Even those who you would not expect to comment and ask are doing so. WOW, music is good therapy and enjoyed by all. I would be interested in obtaining more information about the 5 basic needs of clients with dementia. I work for 3 hrs twice a week with a client with dementia. I used to take her for a drive but since she had a fall she is in a wheelchair. She has a newspaper delivered each day - and she reads out sentences but I don\'t think she understands what she is reading. I am not a diversional therapist - but I have worked in a nursing home as an AIN. Any suggestions for activities that will help stimulate her whilst I am with her would be wonderful.